The Weather Prediction Center folks at College Park, MD generate a 24 hour short range forcast discussion that will quickly summarize the national weather trends for the coming day. Part of the reason for reading this as the third stage of my weather briefing is that the text in this forecast will often refer specifically to weather features that I have already noted on surface analysis and/or 700 mb charts. 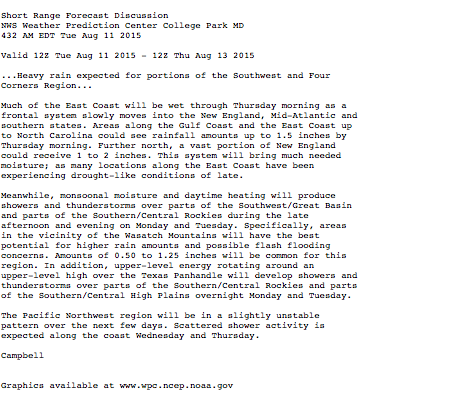 Consequently, this text begins to reinforce the national weather picture that I am developing in my mind.